Planting avocado seeds in water requires you to have access to a medium-sized jar. 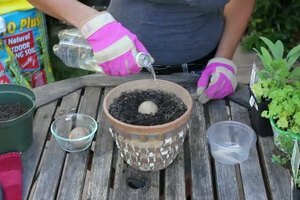 Plant avocado seeds in water with help from a classically-trained chef with experience in both world class restaurants and private dining companies in this free video clip. Hi, I'm Teca Thompson, and today we're going to learn how to plant avocado seed in water. So, I have some toothpicks and a medium-size mason jar. Over here in this bowl I've saved avocado pits from my last batch of guacamole. You're going to take the avocado pit and place it as you would if an egg was upright. You want the cone shape to be up towards the sun and the flat end to be down. We're going to take the toothpicks and place them in triangle around the center of the pit, like so. And this is creating a base for the pit to sit halfway top the water and then on top of the mason jar ring, like this. So, we're going to fill the mason jar, pretty much all the way full of water; a little more; and then we're going to place our seed right on top, making sure that the bottom half is submerged underneath the water and the top half is out towards the sun. Now, you want to check this everyday because the seed will soak up a lot of water and being in the sun also evaporates water and you want to make sure that at all times, the pit bottom is always soaking in water. So, after about three weeks to a month, you'll get a sprout looking similar but smaller to this, which is an avocado plant. And you'll get shoots of roots down in your water. When it's big enough, probably a few inches, you're going to transfer it to soil or directly into the ground, always remembering that avocados are trees, so you want to make sure to give them plenty of room. That is how to plant an avocado pit in water. Thank you and have a great day. Teca Thompson is a classically-trained chef with experience in both world-class restaurants and private dining companies. How Long Can Vegetable Seeds Be Stored? Can a Red Kidney Bean Seed Grow in Salt Water? Can You Put Sunflower Seeds in Water to Germinate Them Quicker? 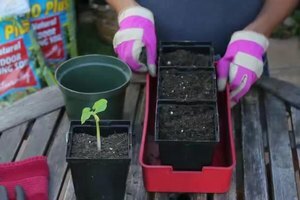 Is it a Good Idea to Soak Seeds Before Planting?